QUEBEC CITY -- A shooting at a Quebec City mosque during evening prayers left six people dead and eight others wounded in an attack that Canada's prime minister called an act of terrorism. Police arrested two suspects. 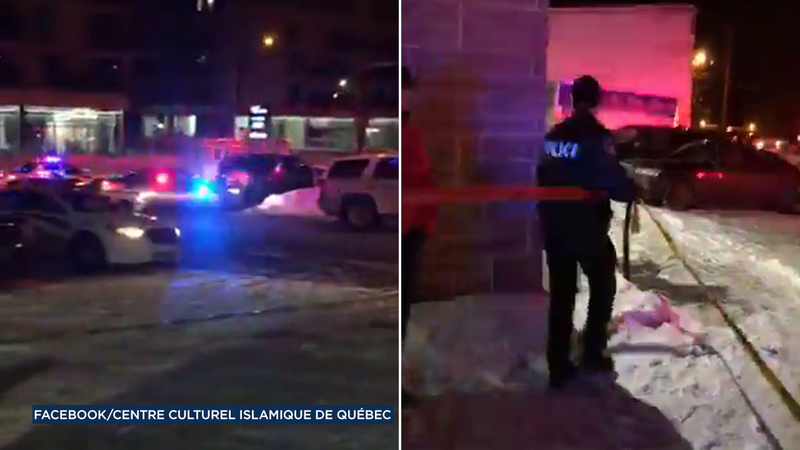 More than 50 people were at the Quebec Islamic Cultural Centre when the shooting erupted Sunday night. Some of the wounded were gravely injured, Quebec provincial police spokeswoman Christine Coulombe said early Monday. The dead ranged in age from age 35 to 70, she said, and 39 people were unharmed. One suspect was arrested at the scene and another nearby in d'Orleans, and police said they did not believe there were other suspects. Police didn't release names of the suspects or give a possible motive. Canada is generally very welcoming toward immigrants and all religions, but the French-speaking province of Quebec has had a long-simmering debate about race and religious accommodation. The previous separatist government of the province called for a ban on ostentatious religious symbols such as the hijab in public institutions. In the summer of 2016 a pig's head was left on the doorstep of the Quebec Islamic Cultural Centre in the middle of Ramadan, when Muslims fast from dawn to sunset. Practicing Muslims do not eat pork. "The Muslim community was the target of this murderous attack," Couillard said at an early morning news conference. He said solidarity rallies would be held across Quebec on Monday. Quebec City Mayor Regis Labeaume, appearing shaken, said, "No person should have to pay with their life, for their race, their color, their sexual orientation or their religious beliefs," Labeaume said. Cultural Centre President Mohamed Yangui said the shooting in occurred in the men's section of the mosque. He said he wasn't at the center when the attack occurred, but he got some details from people on the scene. Ali Hamadi said he left the mosque a few minutes before the shooting and said a friend, Abdelkrim Hassen was killed. He said Hassen, who worked in information technology for the government, had three daughters and a wife, whom he had to notify of the death. The New York Police Department also said it was stepping up patrols at mosques and other houses of worship. Francois Deschamps, an organizer of a refugee-support group in Quebec City, said the motive for Sunday's attack was unknown, but right-wing groups are very organized in Quebec City, distributing fliers at the university and plastering stickers around town. The Canadian Council of Imams said in a statement that "Islamophobia has killed innocent Canadians." "We ask all decent people to stand against hatred of Islam and Muslims in any forum," the statement read. "Our message to anyone in the Canadian Muslim community who may experience Islamophobia is not to suffer in silence."